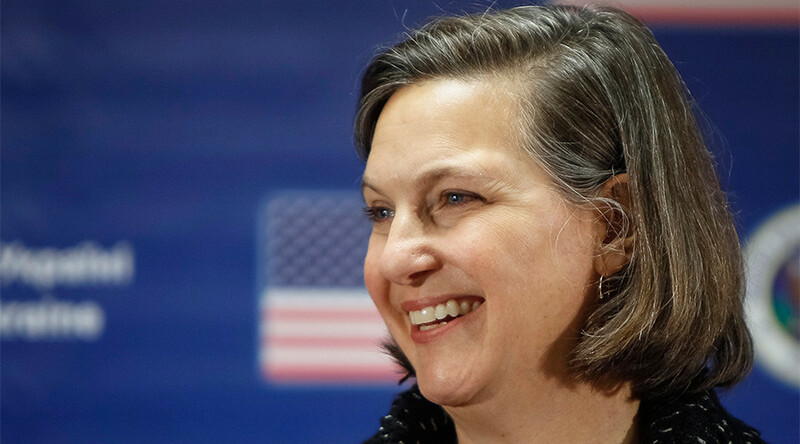 Victoria Nuland, the former Assistant Secretary of State for European and Eurasian Affairs, had her last day at the US State Department on Wednesday. To celebrate, RT takes a look back at her most memorable moments. On February 4, 2014, a leaked phone call between Nuland, the assistant secretary of state, and US Ambassador to Ukraine Geoffrey Pyatt revealed the US’s efforts to shape the Ukrainian crisis. The two discussed who should lead the Ukrainian government, with Arseniy Yatsenyuk being suggested several times. Yatsenyuk became prime minister on February 27. In January 2015, Nuland was asked during a speaking engagement at the Brookings Institute whether she thought RT should be shut down. Although Nuland said it should not, she went on to discredit RT and its numbers. “All you have to do is look at RT’s tiny, tiny audience in the United States to understand what happens when you broadcast untruths in a media space that is full of dynamic, truthful information,” she said. During the Maidan protests in Ukraine, Nuland was spotted amongst the protesters, handing out cookies and buns to those who were calling for the ouster of then-President Viktor Yanukovych following his decision to pull out of an agreement with the EU. In light of Nuland’s resignation from the State Department, many referenced her Maidan cookie moment. Nuland was questioned by the House Foreign Affairs Committee in May 2014.